Aspire Indiana, Inc.’s HIV Services Program is offering red Recovery Glass necklaces in honor of “National HIV Testing Day,” which is Thursday, June 27, 2013. Aspire Indiana will be offering FREE HIV testing at their Noblesville outpatient office on Thursday June 27, 2013 from 9:00--5:00. No appointment is required. Results are available in as little as 20 minutes. The Noblesville outpatient office is located at 17840 Cumberland Lane, Noblesville; next to the Noblesville Library. Aspire Indiana is a private, nonprofit organization that provides therapy, recovery, housing, and employment services to people living with behavioral and mental health disorders, addictions and substance abuse. Aspire offers services to families and individuals of all ages at eleven locations conveniently located throughout Central Indiana, including Madison, Hamilton, and Boone, Counties and Washington and Pike Townships in Marion County. Aspire began providing HIV services in July 2000, when the organization was awarded its first HIV Care Coordination contract in a seven-county region located in north-central Indiana. Aspire’s HIV services have since expanded to include 26 other counties, for a total of 32 counties. Geographically, Aspire Indiana is the largest HIV service provider in the State of Indiana. Services have also been expanded to include Housing Opportunities for People with AIDS (HOPWA), and Special Population Support Program (SPSP). Recovery Glass is made by tumbling broken pieces of glass until the rough edges become smooth. It is symbolic of a life that once seemed broken and lost, but through the storm, the rough edges became smooth, and the soul is healed. With the help of one of our consumers, Aspire has taken pieces of tumbled glass and turned them into beautiful necklaces - Recovery Glass Necklaces. 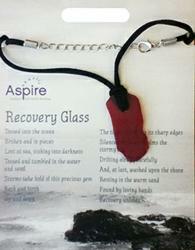 Recovery Glass Necklaces are available at all Aspire outpatient offices.